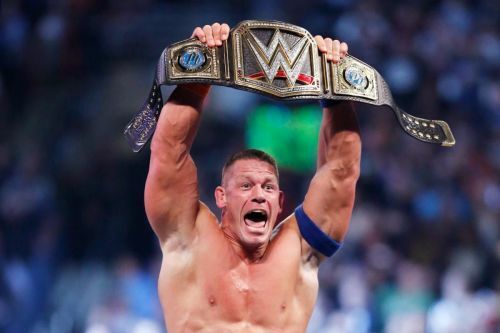 John Cena is undoubtedly one of the most decorated superstars in WWE history and the Leader of Cenation is currently tied with Ric Flair in terms of highest world title reigns. 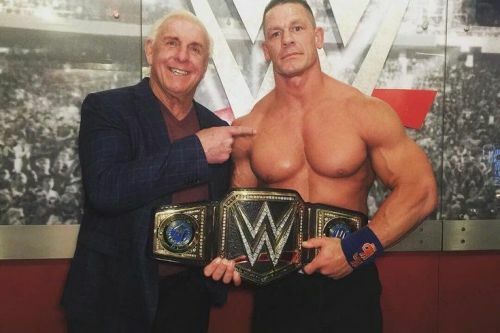 Both Cena and Flair are 16-time World Champions (most by any superstar) while Flair has retired from in-ring competition, Cena is still wrestling and could well break the Nature Boy's record. Daniel Bryan is the current WWE Champion on SmackDown Live and the WWE Championship was the last title that Cena held in the WWE. Cena became a 16-time World Champion when he defeated AJ Styles at the Royal Rumble PPV two years ago. Cena is no longer the superstar that he was earlier; he wrestles on the big shows of WWE and does not appear every week on RAW and SD Live. The Face that Runs the Place made his emphatic return to WWE TV this past week where he teamed up with Becky Lynch on SD Live. Cena is advertised to make an appearance on RAW next week and we can expect him to be on TV at least until WrestleMania 35. John Cena is the biggest reason why WWE is the product that it is today. It was Cena's immense popularity which drew the audience towards Vince McMahon's company and that is the reason why Cena deserves to be a 17-time World Champion in WWE. The Leader of Cenation has taken the WWE to newer heights something the Nature Boy had not done in his entire career. Cena was the face of the WWE ever since it went PG and it has made him a Superhero in the eyes of young kids, again something that Ric Flair could not do in his career. 4 reasons why Vince McMahon is not as rich as he should be.